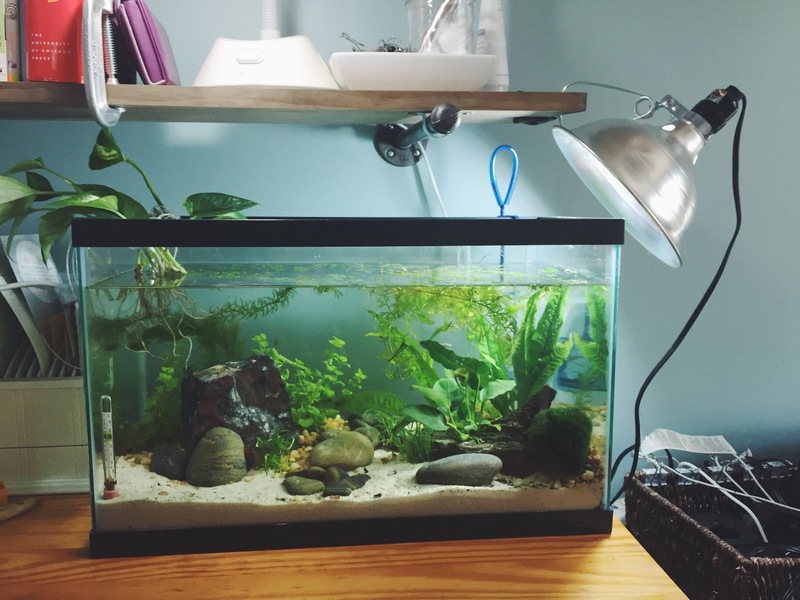 Ten Gallon Walstad with Fish! 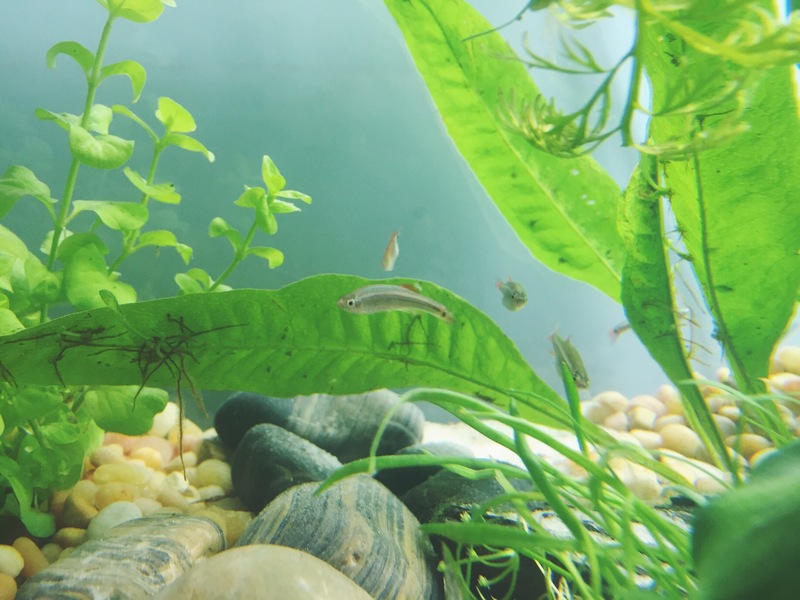 So after reading a ton about planted tanks, and Walstad tanks in particular, I realized the reason I never really got any readings for Nitrites and Nitrates on my bowl before the ammonia dropped was that these tanks don’t work like the typical non-planted tanks. There’s this thing called a “silent cycle” where none of the readings ever spike as long as you are maintaining the tank, poking the soil until the roots are established (7-10 days, when you see significant growth), and testing daily. 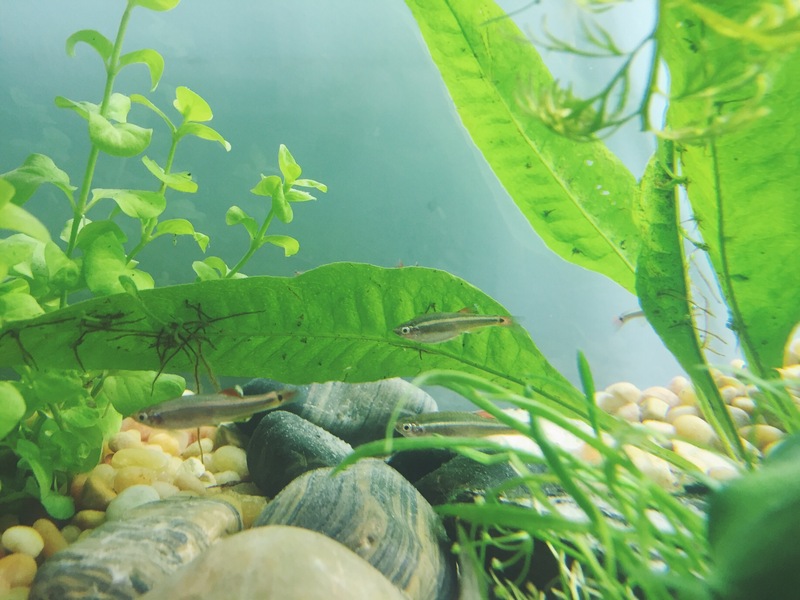 Any ammonia issues can be solved by water changes and treating with Prime as a back-up just to be safe for the fish. But the exciting thing is you can essentially add fish immediately. Some wait up to a week, I waited about 48 hours to give the plants a head start. Six of these cuties came home with us last night. 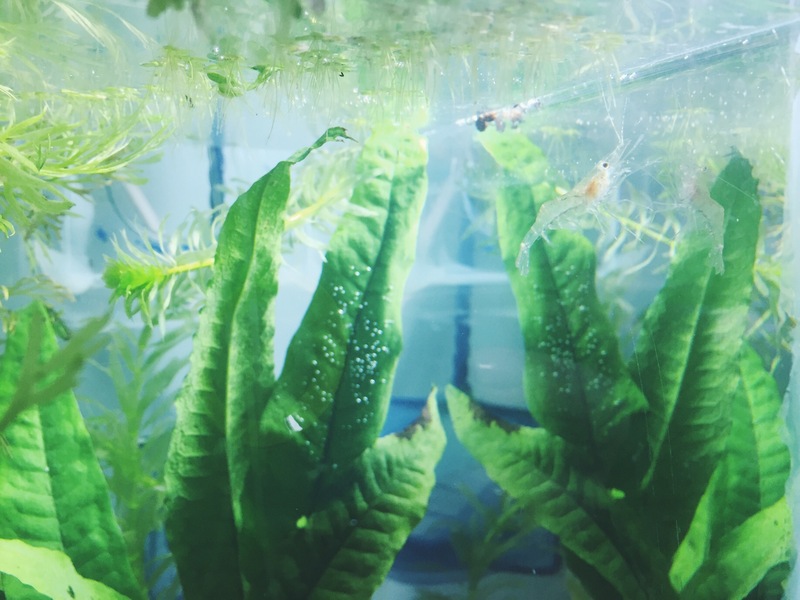 I don’t have a drip acclimation system so I set their bag in a large vase on my desk next to the tank after pouring out over half the water they came home in very carefully. I started using my 5 ml dropper to squirt water every few minutes into their vase, a little at a time, for well over an hour (probably closer to an hour and a half, until the water volume was triple what they’d started with. 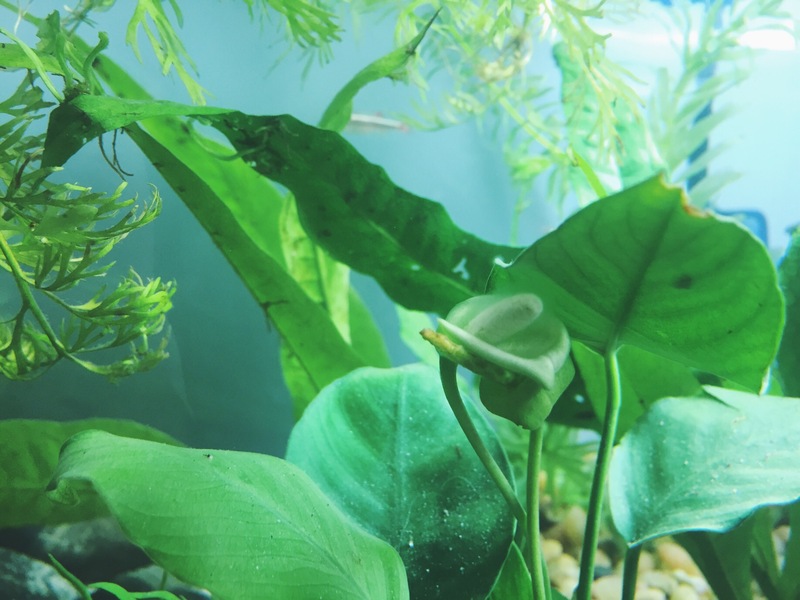 Then I netted them and released them into the big tank. 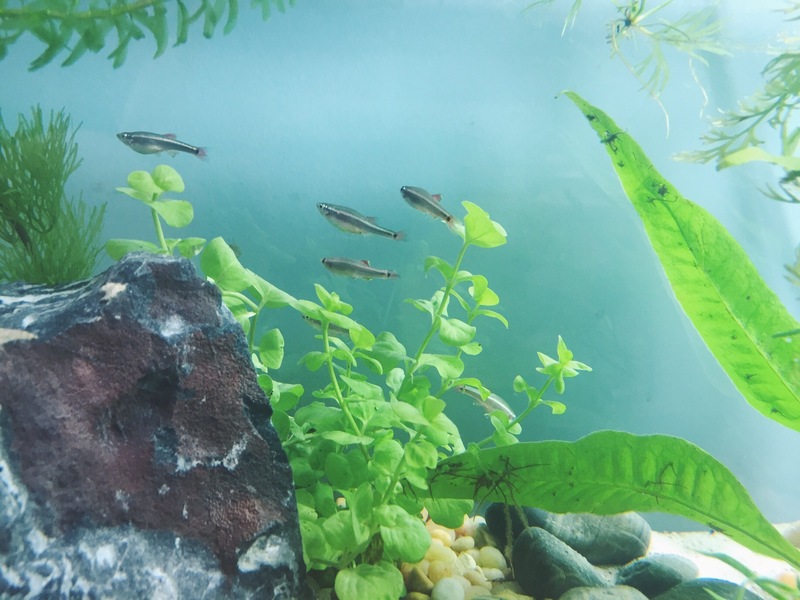 I’m pretty sure I have 2 males and 4 females, and I’ve read their perfect breeding temperature is 68 degrees which is pretty much what this tank stays at. This morning all 6 are healthy and active, ate well, and there was barely any ammonia registered. The color on the test was faintly green, so something less than 0.25 ppm. I’m going to do a 25% water change and treat with Prime just to be extra safe. 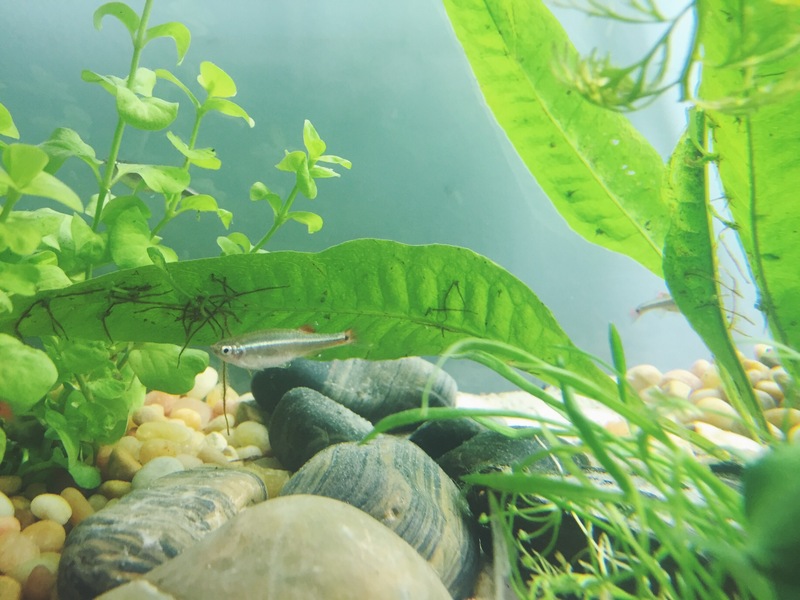 Both shrimp are thriving and swimming in ways they couldn’t in the bowl because it was too stuffed with plants. Seymour has been moving around more too and even parachuting from time to time which is really fun. And the Anubis is putting out its second bloom! It’s good it’s pretty because its driftwood was infested with tiny pond snails. I’ve manually removed them over the past 2 days and I’ve only found one today so far. 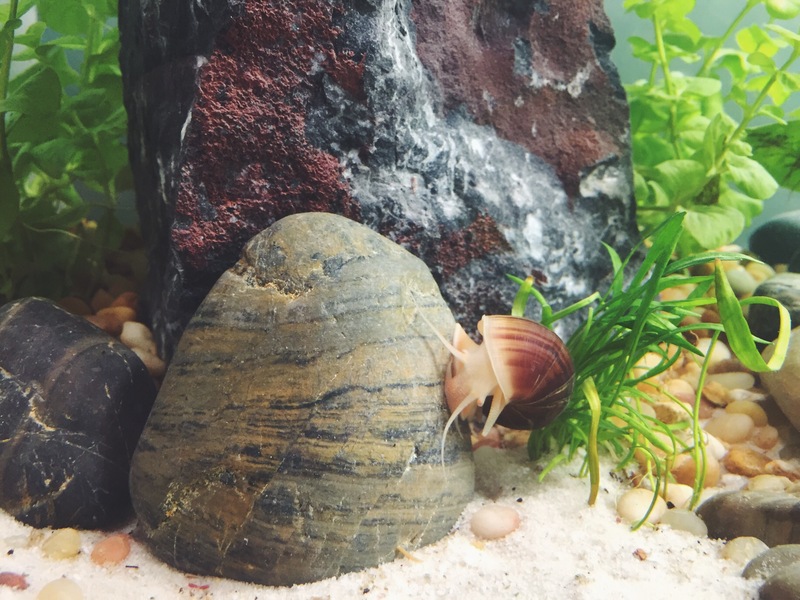 The first morning after I planted the tank out, I scooped out at least 12 or so. I may have to get some lettuce, I read that if you put a leaf of lettuce in the tank at bedtime, the snails will be all over it in the morning and you can trap them that way. Plus, I think I read that Romaine specifically was a good snack for the WCMM. I need to go double check that, but either way it won’t hurt. Vivarium update 2+ months and frogs!